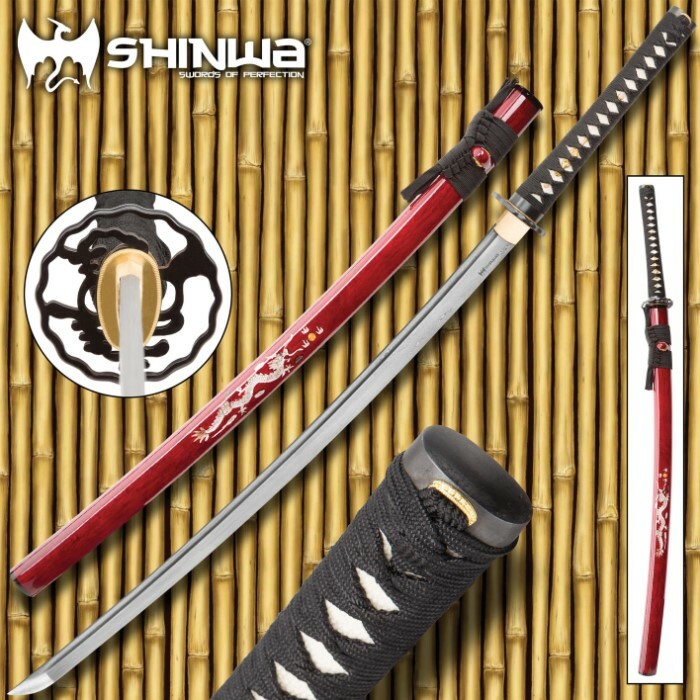 The perfect embodiment of the great dragon of myth and legend, Shinwa's "Imperial Dragon" Katana is big, ferocious and nothing short of awe-inspiring. It wields with the grace of a dragon in flight and has a bite as savage bite on par with any of the most infamous fire-breathing saurians of lore. But unlike Smaug, Draco or any other fabled dragon, the monstrous "Imperial Dragon" is real. Very real. And reality can be far scarier than fiction – especially when you’re on the receiving end of this potent Shinwa katana. A feral brute adorned in the trappings of royalty, the Imperial Dragon dons all the aesthetic hallmarks that make traditional Japanese cutlery so visually appealing, plus plenty of updated features and chic appointments that afford "the Dragon" a style all its own. Delicately textured genuine ray skin same and braided ito cloak the tsuka, beautifully complementing the distinctive cast metal tsuba. 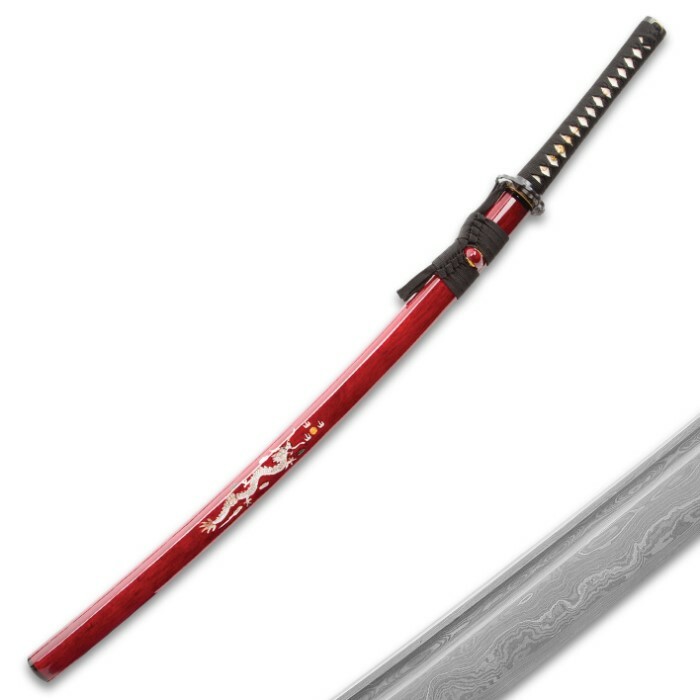 And while many swords’ beauty and allure is concentrated at the tsuka or hilt, rarely extending onto the unexciting, largely utilitarian blade; the Imperial Dragon’s blade is teeming with visual splendor – a breathtaking wonder in its own right. Hand forged from Damascus steel, the bewitching tanto blade is a tumultuous sea of contrasting lines, waves, swirls and other mesmerizing patterns. Each line is a distinct variety of steel, hammer welded and hand folded repeatedly to yield the more than 2,000 layers in each "Dragon" blade. The unique metalsmithing technique’s roots stretch back to the Middle Ages, and today it’s still painstakingly performed by seasoned hands – no automation, no mechanization. To make each Imperial Dragon blade, a Shinwa master swordsmith fires a stack of steel blanks - each piece a different alloy - in a white-hot forge until the metal glows red hot. He then removes the stack and hammers it until it’s around half as thick as the original. Then he folds the metal onto itself lengthwise and hammers each half together. The process is meticulously repeated – hundreds of times in some cases – until the desired layering effect is achieved, at which point a final quenching strengthens the resulting blade blank and an acid etching highlights vivid contrasts in the layers. And the slow, laborious process itself it just the beginning! In order to achieve sufficiently dramatic contrasts, Shinwa’s master smiths must expertly select an appropriate combination of steel alloys of varying color, luminescence and other visual qualities. For the sake of strength, resilience and countless additional blade factors, the smiths must also must consider each alloy’s distinct melting point, proper stacking order, forge temperature and myriad other variables. Simply put, an unbelievable quantity of blood, sweat and tears goes into every Imperial Dragon blade. Furthermore, like a steel snowflake or fingerprint, the patterning on no two is exactly alike. 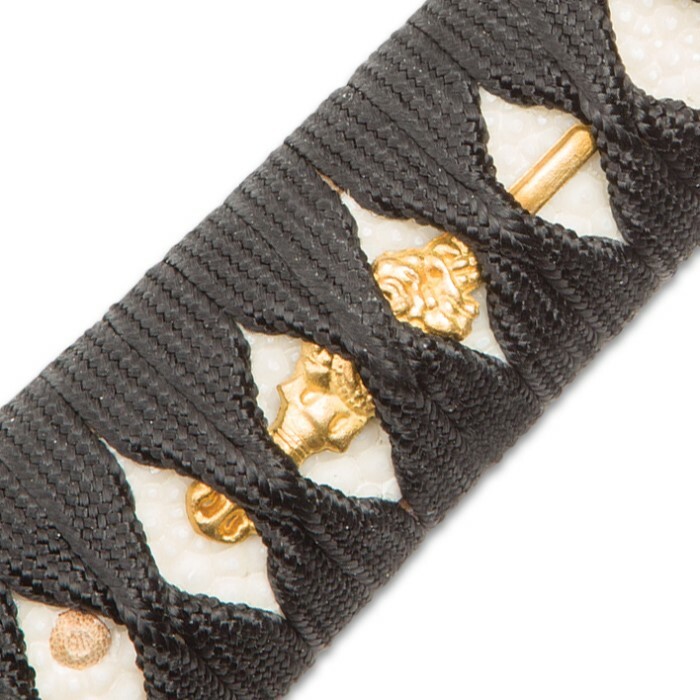 The blade's visually electrifying beauty is matched only by the exquisitely adorned hand-lacquered saya. Paying homage to its namesake, a stately Eastern dragon lithely dances across the saya in a spectacularly detailed mother of pearl inlay. Like a fine opal, the mother of pearl glints and shimmers with shades of azure, emerald, ruby and pearl. The hand painted sun and cloud accents that encircle the central dragon impart the feel of a traditional Japanese watercolor illustration. It's the kind of otherworldly allure that demands to be shown off - in a collection, mounted on the wall, on a mantle or any other space. And when the ever-fierce Imperial Dragon Katana makes a demand, one best take heed! 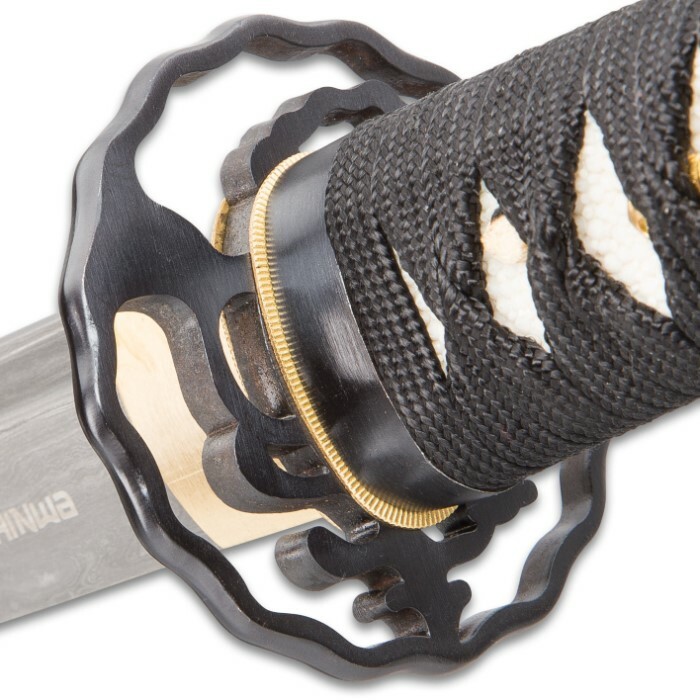 From beauty to power to hand craftsmanship, Shinwa's Imperial Dragon has everything the serious swordsman and/or collector looks for in a top-shelf katana. Indeed, the "Dragon" casts a far-reaching shadow that obscures other swords, making them seem comparatively dull and lifeless. But you won't pay close to "top-shelf" prices for this exceptional handmade Damascus steel masterwork! 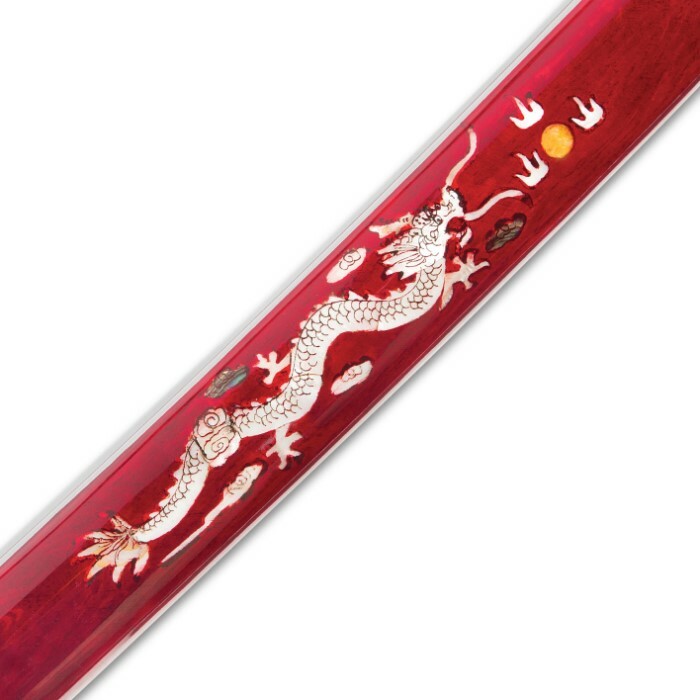 The Imperial Dragon represents one of the best values on the fine sword market, and once you wield it once, you'll never want to put it down. Rare bladed gems like this don't come around often, so don't deny yourself the sword experience of a lifetime - add the "Imperial Dragon" to your sword collection today! 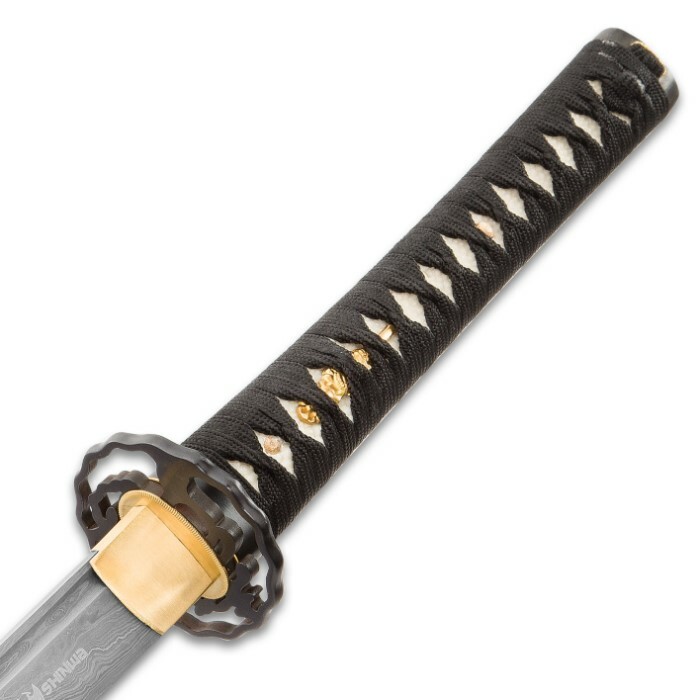 Compared to the Honshu Boshin Katana, this beauty is far superior. Sure, the blade itself is a bit shorter but the handle is also a bit longer than the Honshu. it's also much lighter. looks amazing too. nothing on it wiggles even slightly, which bugged the hell out of me with the Honshu. don't know how it cuts anything and I don't intend to find out. Once I get past the fact that i paid for and bought the sword 2 days before it went on a 50% off sale, its was pretty good. It isn't very sharp and doesn't cut well, but the blade is of a very high quality and will last forever if taken care of. Before I got it sharpened, I took it to a battle test where we go full speed sparring competition style. It withheld zero damage during battle and only a few minor scratches. This Damascus Steel blade, once sharpened able to cut through bamboo stalks, real Tatami mats, and even all the way through a cow thigh. I recommend this sword to anybody that's getting started as the blade will last a long time and once you are ready, you can get it sharpened. Isnt a black blade like it shows but it is stunning none the less. Sharp and gorgeous to look at. The pattern on the blade is nice to look and the blade is well balanced and built. Standard shipping took 6 days to get it less than the 7-10 quoted. A good blade with some good craftsmanship. Thank you guys for a great product. The first thing I did after unwrapping layer after layer (which is a good thing when shipping such a delicate item) was cut myself. This is a stunning blade, the patters end up unique for each one, and the one I received had an amalgam of designs that were symmetrical yet full of novelty. It took a little bit of cleaning the blade and adding oil to it to get a shine but that is no issue and is expected. The service and the shipping were phenomenal. I ordered on a Sunday and received it the following Wednesday afternoon with a standard option. Stellar. Shinwa does not lie with the sharpness and TrueSwords does not lie with its service. Thank you all. When I got this sword I was ecstatic. It is a very beautiful blade and very well put together, and there is no rattle in the hilt. However, the only problem i have with this blade is when I cut a small 16 oz plastic bottle of water in half with it. The cut was successful however once i looked at the blade afterwards i noticed to nicks in it. Still, its a very excellent sword overall (I guess I`m going to sharpen it now). Still, I would recommend this as a somewhat functional sword. Just be careful with it, it is very sharp out of the box. I had plans to make this part of my bug out bag but now im not so sure. Got this sword in about 2 days after purchase, amazing time! Honestly, this sword is very beautiful, but lethal as well! I have been trying to find ANY cons about this katana for a few weeks now, and I have none.. The blade is beautiful, real damascus steel. It is very sturdy, it does not rattle what so ever. The fit into the scabbard is a tiny bit too tight but that can be fixed easily with a bit of sand paper.